This summer, when Hurricane Harvey hit Houston (say that five times fast) one of the issues that Texas faced was getting food supplies. Even for many of us that were safe, we either couldn’t get out of our houses for a few days, or the store shelves were getting pretty bare since the trucks delivering food weren’t able to get in. As we were preparing for Harvey, I joined the hoards of people running to the store to stock up on items- mainly fresh items like milk, bread, eggs, fruits and vegetables. As I was panicking slightly trying to find the last few remaining jars of my beloved peanut butter on the shelves, I calmed down and realized that we weren’t going to go hungry. I knew I had enough food storage to stretch at least a month at home already. While we didn’t end up eating much of our food storage supplies, it was comforting to know that they were there. And I want everyone to have that safety net. We can only prepare for emergencies to an extent. There are things beyond our control. But I can tell you that any small measure of preparedness in an emergency will bring you and your family a sense of comfort. That’s why every week I will be sharing information with you about what you can stock up on. Many of these things are timed to coincide with what time of year things go on sale. There is no set amount of what you need to buy each week. Buy what fits your budget. If all that’s in the budget one week is an extra box of pasta, then buy an extra box of pasta! Every little bit helps get you to the goal of having a little something in place for emergencies. Maybe you’ll never have a Hurricane come your way, but there are many other natural disasters that do happen. I even have two friends who’s husbands were unemployed for a while, and they lived off of their food storage, supplemented with only a few dollars a week of fresh items from the store, until they were employed again. 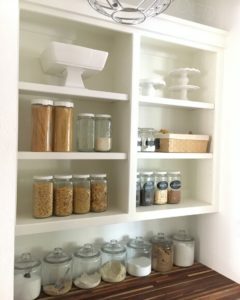 Their food storage made their savings stretch so much further so instead of money going towards food, they were able to pay their bills and mortgage or rent. Emergency preparedness is much more than food, though. In fact, most of the first few weeks of the plan aren’t food items. I’ll link all the weekly posts that explain what we will be stocking up on each week below for your convenience.